Wicca, also known as Witchcraft or the Craft, is a very modern religion. It developed in the first half of the twentieth century, primarily in England, and was popularized in the 1950's and early 1960's by a Wiccan High Priest named Gerald Gardner. Followers of Wicca religion are usually known as Wiccans, Witches or Crafters. Wicca is typically a duotheistic religion, worshipping a Goddess and a God, who are traditionally viewed as the Triple Goddess and Horned God. In some variations these two are ultimately seen as part of the Ultimate One. The Pentacle or five-pointed star is a popular Wicca symbol. Wicca tradition states that the Universe is made from 5 elements - Air, Fire, Water and Earth, plus Aether/Spirit, which unites the other four. Each element has been associated with a cardinal point of the compass; Air with east, Fire with south, Water with west, Earth with north and the Spirit with centre. Inspiring pagan gifts for herWhat better way to celebrate Valentine's Day than by gifting your Goddess a Wicca Mother Goddess gift. Show how much you love and adore her by gifting a Mother Goddess statue, poster, jewelry piece, or one of the many other items available. I really admire nature - her beauty and strength - and think these would be cool gifts for followers of other faiths too, and even people who don't believe in any religion. See also these Mother Goddess Statues , ornaments and posters. See also the beautiful fairy posters. The Tree of Life symbolizes many thing things in the Wicca tradition. According to some interpretations it takes us back to our creator, the Goddess, so that we can be reborn. Some philosophers say the Tree of Life entered the Wicca religion through Kabala. Whatever be the source - the Tree of Life is a powerful and beautiful symbol of nature and life. Gifts depicting this symbol are very appropriate for Wiccan women on Valentine's Day. Though there are numerous symbols associated with Wicca - following are the primary ones and most easily recognizable ones : Pentacle - The 5 pointed star, Cauldron - the symbolic womb of the Great Mother Goddess, Chalice - a modern version of the cauldron. It represents yin/female energy of water, Athame - the knife represents the ability to separate things, to make distinction/choice, and Wand - associated with yang energy, the power to create change. Every Wiccan will want one of these. 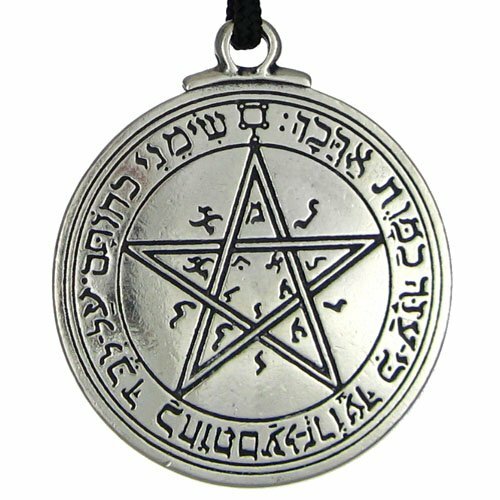 The Pentacle is the only one regularly available in jewelry. Shown here is one designed for men, though I don't think women would be ashamed to wear it either. Though the Pentacle/Pentagram is the most popular symbol of Wicca religion; when it comes to Jewelry - the choices are not limited to it. Apart from the 5 pointed star there are numerous Talismans, Crystals, Runes, and other symbols which can be gifted in the form of Pendants, Rings, Charms, Earrings, Bracelets, and Body Jewelry. I really find the Wicca symbols and designs full of energy. Hope you will like them too. Woo your Valentine with these beautiful pieces of Wicca jewelry. Finding appropriate jewelry for men is always a struggle. Because men wear less jewelry in general, the pickings are smaller than for women. Male witches however have the advantage that most wiccan and pagan jewelry isn't too feminine in look. 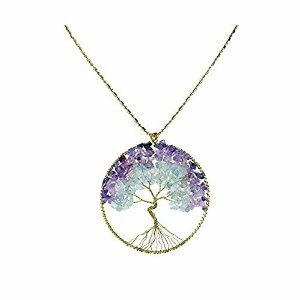 Also, the tradition is such that people will appreciate a nature inspired pendant on a man as much as on a woman. Shown here: Seeds of Light Gods of Strength, a Protection Charm Amulet . Love talismans aren't just for getting love, they're for keeping it too. Giving your partner one of these says: "I want our relationship to succeed and I respect your Wiccan ways". She'll love you all the more for it. If your Valentine is a sort of girl or guy who like to read - there can be no better idea than gifting her books related to the Wicca religion and philosophy on Valentine's Day. There are cool books available which delve into various aspects of the Wicca thoughts and practices. Shown here is the Wicca Bible, which is very useful for clearing up common misconceptions. Do witches celebrate Christmas? Many do - because it doubles as yule aka midwinter. They may even be kind enough to let you call it Christmas, and exchange gifts. Wondering what to give them? On this page you'll find lots of pagan and wiccan gift ideas. See also: Native American links, gifts etc. I usually can't talk about this subject without putting my foot in my mouth. Wiccans are NOT evil. They are NOT devil worshipers. Many call themselves witches - partly to stand up against ancient prejudices like the assumptions that witches were evil. They are people like you and me whose spiritual path has taken them to look for the sacred in nature. Wiccans usually worship a God and a Goddess, though the stress is often on the female Goddess, more than the male God. Paganism is a more general term which is used by people of all kinds of alternative spiritual traditions who use prechristian traditions (often shamanistic ones) as inspiration for their day to day lives. They too look for a large part of their spiritual inspiration to nature. Paganism and Wicca both tend to look to the cycle of the moon (the lunar cycle) in their rituals, which is one of the reasons many of these calendars have information on the phase of the moon. Witches calendars will have these listed. Witches usually celebrate the following days. The dates are approximations, because they often depend on the cycle of the sun. December 21: WINTER SOLSTICE - starts the Yule season. This date is the winter equinox, or the shortest day of the year. March 21: SPRING EQUINOX, also called Ostara or Eostre. At this time night and day are of equal length (both 12 hours). May 1: BELTANE, also called May Eve, Samradh, Cetsamain, and Walpurgis Night. Beltane is sacred to Maia, Greco-Roman goddess of spring. It is a fire and fertility festival which celebrates the transformation from maiden to mother. June 21 or 22: LITHA, also called Summer Solstice, Midsummer, and St. John's Day. This is the longest day of the year. August 1: LUGHNASADH, also called Lantmas, Lunasa, and Halfmass, the Festival of Loaves. September 21: MABON, also called Autumn Equinox. Again night and day are of equal length.